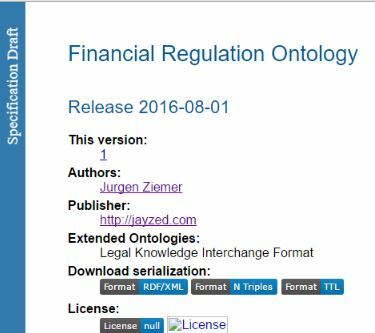 We validate our “Fund Adviser Exemption” in the target ontology. 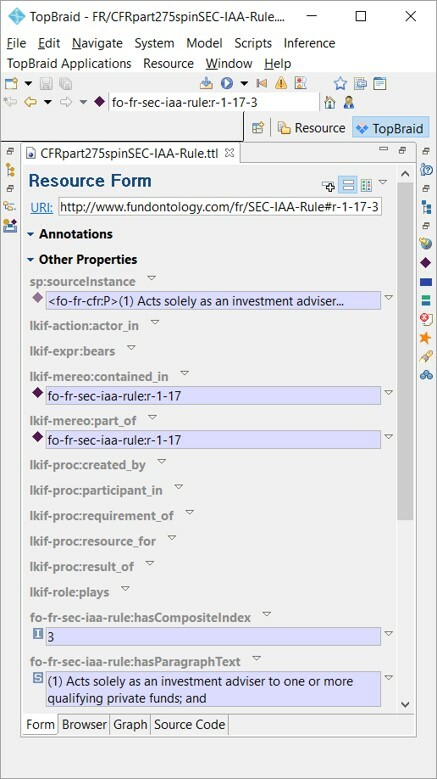 Left is the section instance SEC-IAA-Rule#r-1-17. The data properties for index, section citation, number and subject have been populated. The data lineage property sp:sourceInstance points to the original CFR Section instance. Object property lkif-mereo:contains has instances for all paragraphs in section r-1-17. 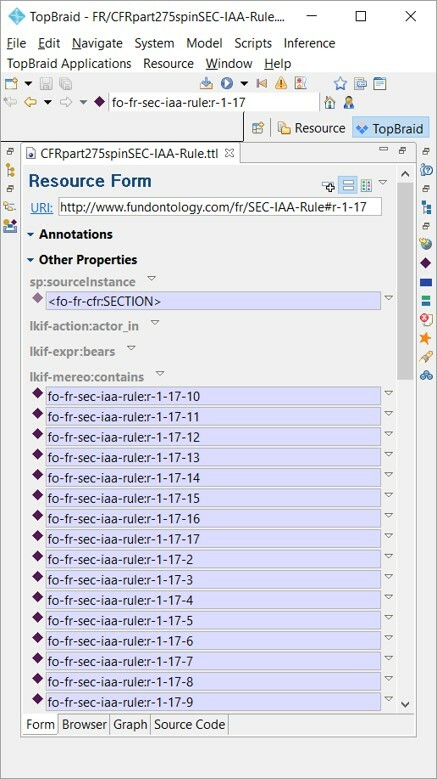 The data lineage property sp:sourceInstance points to the original CFR paragraph instance. The inverse property contained_in references section r-1-17. Contained_in is rdfs:subPropertyOf part-of. The reasoner will automatically infer a triple for the parent property. Finally, the paragraph text has been transformed to a data property hasParagraphText. The graphic shows FRO Section and Paragraph instances and related classes. All Sections have an object property, fo-fr-legal-ref:divides pointing to the anchor, CFR_Part-275. From the Part we navigate static Reference Data has the CFR Part, Chapter, Title and Volume. Part 275 also refers to the Security and Exchange Commission’s rulemaking. The sp:sourceInstance object properties ties Paragraph and Section instances to their CFR Source. Section and Paragraph with their data properties. Exemption section CFR-2012-title17-vol3-part275.pdf from the GPO website. § 275.203(m)–1 Private fund adviser exemption. (a) United States investment advisers. (b) Non-United States investment advisers. § 275.203(m)-1 Private fund adviser exemption (2) Manages private fund assets of less than $150 million. § 275.203(m)-1 Private fund adviser exemption (2) All assets managed by the investment adviser at a place of business in the United States are solely attributable to private fund assets, the total value of which is less than $150 million.